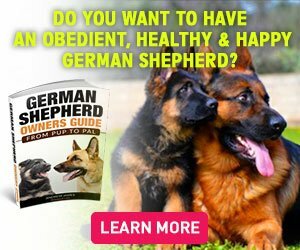 The German Shepherd Temperament Aggressive or…? Those who aren’t familiar with German Shepherds may only know them as police dogs, military dogs, search and rescue dogs and tracking dogs. But they actually have a well-balanced demeanor and are capable of being sweet, compassionate and loyal. They are capable of being a therapy dog as much as a police dog. While some may find the look of the German Shepherd intimidating they are actually one of the most well-balanced temperament dog breeds in the world. German Shepherds are commonly described as self-assured, excellent guard dogs and easy to train. But they also hold a variety of wonderful characteristics such as intelligent, alert, watchful, curious, obedient, courageous and confident. These amazing characteristics make them well-rounded and equally able to adapt as a working dog as well as an excellent family dog. One important characteristic German Shepherds have their work ethic. They are eager to please and perform their given tasks to perfection. They enjoy working and therefore make great working dogs. Not only are they excellent when working with the military or police as mentioned before, but they are also great herd dogs. Farmers who have plenty of livestock will find that a GSD will be their best worker and best friend. Farmers will find that a German Shepherd will gather and drive the herd to the desired area with quickness and ease, but they are also capable of guarding the livestock against harm as well. The GSD is a deeply kind soul that is capable of showing compassion for humans. When trained properly they are capable of becoming helpful therapy dogs for the blind and those with disabilities. A new area of expertise is fast on the rise as emotional healing dogs. Their sweet, gentle nature allows them to be near others that are experiencing emotional issues such as depression. It is a fact that petting a dog lowers blood pressure in people. Imagine the beautiful combination of lowered blood pressure and the comfort that a German Shepherd can provide to someone who is suffering. It definitely has a positive impact on the patient as well as the GSD. The German Shepherd has a natural protective instinct that does not waver. His deep desire to protect his owner and family is unmatched, and the GSD is even known to put his life in danger to save others. This selflessness is possessed by his desire to guard loved ones and is a characteristic that remains strong in the breed. In addition to naturally protecting their human family, German Shepherds are known to protect the home as well. GSD dog owners can usually rest assured that they are safe when their dog is around. German Shepherds can also be trained to take their protective instinct one step further. Some businesses rely on the protective instinct of the GSD to guard their property and the valuable merchandise it holds inside. This is why many people see the German Shepherd dog breed located in or around businesses that are outdoors such as car lots, construction sites, and warehouse environments. This is also the same reason why many people that are not familiar with the breed view them as harsh and scary when this is farthest from the truth. Dog owners that have children young or old will be delighted to hear that a German Shepherd has a loving kind nature and is good with children. While it is wise to socialize your GSD from a young age to be around a variety of age groups including young children, there have been many situations when an adult German Shepherd was welcoming and loving towards a new arrival. 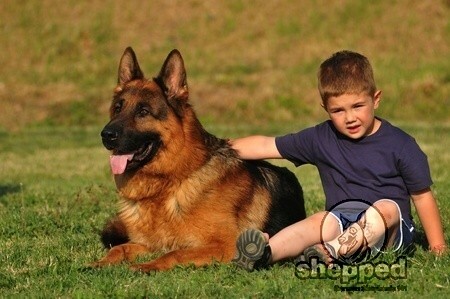 In addition to being kind, the GSD is also capable of being a fun playmate for children as well as their protector. It is captivating to watch as a GSD cautiously plays with young children and at the same time as the ability to calmly guard and protect them from harm. There have been many stories old and new of situations when a GSD saved the life of a child by using his protective instinct. German Shepherds have such a well-balanced temperament that they have the ability to adapt to any situation quickly and easily. There is always a reason for their reaction. GSD have the ability to hang back and observe people, other animals and fairly judge or sense if there is the intention of harm. German Shepherds are not easily friendly with strangers and need some time to read them before making the decision to befriend the stranger. This takes time, and there is not a precise time frame to measure, it really depends on the individual dog. This ability to properly react to people, other animals or environments makes the GSD temperament truly special. You can honestly say they think before they react. Since German Shepherds are capable of barking at friends that visit until they become more comfortable with guests, it is wise to socialize your GSD immediately upon arriving home for the very first time when they are a puppy. If you happen to adopt an adult GSD, you should slowly introduce friends and relatives to your dog. Begin by bringing your GSD puppy home and introducing him to the family that lives in the household. Allow each family member to hold him, play toys, feed him and pet him. Invite family members or friends that visit your home frequently to come over to meet your GSD pup. Introduce them one by one and allow each person to hold your pup. Allow children of all ages that visit your home to play with your pup and become playmates. Encourage the children and your pup to play together by teaching the children how to be around a puppy. Advise them of rules like no ear or tail pulling and no hitting. Take your pup for frequent walks in your neighborhood. Allow him to become familiar with other dogs and people by stopping for a moment when you come across a neighbor or a dog. Allow your pup to play with others at the dog park. These days dog parks have separate areas for small dogs, so make sure you choose the right area. You don’t want your puppy playing with the big dogs yet. Carefully watch your GSD puppy interact with other small dogs. Remove him from the environment if you see any unusual or aggressive behavior whether it is the other dogs or your dog. Let your puppy tag along with you. If you have restaurants in your area that allow you to eat at tables outdoors, bring your pup along so he can meet new people and learn how to behave in a highly traffic social environment. It is rare, but if you notice that your pup is experiencing extreme stress, anxiety, fear or anger in social situations seek help from a trained professional. Licensed dog training specialists have the ability to focus on the behavior problems and offer a solution. They will teach you how to correct your dog’s behavior by providing you with helpful tips and tools. Following the professional dog trainer’s advice is essential to your GSD pup’s behavior improving. If you find that the training is not helping, visit the veterinarian for further assistance. Sometimes a dog’s behavior is displayed due to pain and discomfort due to an illness. It is also wise to keep a notebook and document when your pup has behavioral issues. Note how many people were in the room at the time, the environment, noise level and the reaction of your pup to the situation. Bring this notebook along with you when you visit the professional dog trainer as well as the veterinarian. These details will help pinpoint the behavioral or physical problem. All in all, the German Shepherd has a well-balanced temperament and is an extraordinary dog, especially when trained and socialized properly.